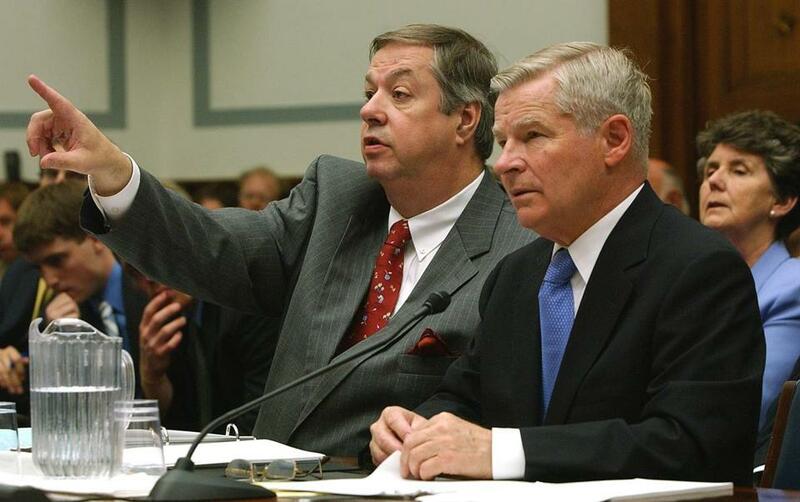 Attorney Tom Kiley, left, made a point as then-UMass president William Bulger, right, testified under a grant of immunity in 2003 before the House Government Reform Committee. The panel was studying the FBI’s use of informants. Paul Cellucci deserved better than to have his memorial service sullied by William Bulger. 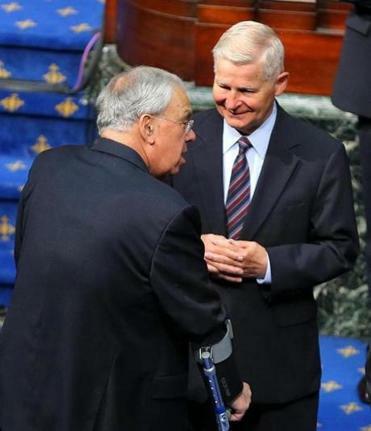 The Massachusetts political establishment paid a fond tribute to the former governor and ambassador, who died this month of Lou Gehrig’s disease, at a State House ceremony filled with dignitaries from across the political spectrum. It was heartening to see old rivals join in honoring Cellucci, an engaging, public-spirited mensch — the kind of politician who gives politics a good name. But Bulger’s presence at such an event wasn’t heartening. It was disgraceful. And so was the reception he met. To anyone who didn’t know better, the former president of the Massachusetts Senate appeared to be just another Beacon Hill grandee — a longtime public official, now retired but clearly still at home in the political realm where for decades he wielded so much influence. But of course everyone did know better. Everyone in that House chamber knew that while Bill Bulger was “seated up front, applauding with all the rest,” as the Globe reported, his brother, the gangster and accused serial murderer James “Whitey” Bulger, was “seated a few miles away, in federal court in South Boston,” on trial at long last for a blood-chilling catalog of alleged crimes, including 19 grisly killings. Everyone knew that Whitey could have been brought to justice long ago if he hadn’t fled in 1995, tipped off by a corrupt FBI agent that he was about to be indicted. Everyone knew that during all those years when Whitey was a fugitive from the law, high on the FBI’s Ten Most-Wanted list, Bill refused to condemn his sibling’s alleged crimes and never urged him to surrender to the authorities. Mayor Thomas Menino talked with William Bulger during a service for former Governor Paul Cellucci on June 13. And everyone knew that in the name of family loyalty, Bill Bulger had declared coldly that he would rather shield a suspected homicidal psychopath than lift a finger to get him off the streets. All this has been known about Bill Bulger since that grand jury testimony was leaked in 2002. Such moral deformity would have been shameful in anyone, but in Bulger’s case it was repugnant. For decades he had been a public official; time and again he had raised his right hand to take the oath of office: “I, William Bulger, do solemnly swear that I will bear true faith and allegiance to the Commonwealth of Massachusetts, and will support the constitution thereof. So help me God.” Yet for years his true faith and allegiance had actually been to his monstrous brother. Not to the people of Massachusetts, not to the law, not to Whitey’s innumerable victims, not to the truth — and not to God. The scandal that ensued eventually cost Bulger his job as president of the University of Massachusetts. It befouled any reputation he might have had as a man of honor and integrity. It certainly shattered whatever was left of his family’s political brand, already so weakened that when his son entered the race to succeed Bulger in the state Senate, he was crushed in a landslide. But if Bulger can still walk into the State House and be greeted like a respected elder statesman, something remains profoundly rotten on Beacon Hill. His betrayal of the people who elected and empowered him, his callous disregard for those his brother terrorized, should make him radioactive in respectable political circles. He should have been ashamed to show his face at the service for Cellucci, not “seated up front, applauding with all the rest.” The sycophants and politicos who were glad to hobnob with him could stand some serious self-scrutiny. Bill Bulger isn’t just another aging pol. The brother he helped protect wasn’t a well-meaning rascal. The horrifying testimony coming out of Whitey’s trial in South Boston is a reminder of what true savagery is. Bill Bulger vowed he would never help bring his savage brother to justice. Why would anyone want to be seen with him?